After a short flight from Sacramento to San Francisco our merry-little group from California boarded their non-stop flight from the West Coast to Israel. This was my twenty-fourth trip and may have been the best ever. To watch forty-three people come alive, constantly use the word “overwhelmed” and fall in love with the people and The Land of Israel; it really doesn’t get any better than this. Dr. Stauffer did a superb job teaching and driving home the point that we, the church, are grafted into a thriving Jewish root; did my heart good and I know it pleased the Lord too. Great weather, wonderful people new friendships forged and memories stored away for a lifetime. We did our fare share of touring, walking, shopping, eating, laughing and enjoying this beautiful piece of heaven here on earth. Since you can’t get enough of a good thing we are already working on the next “Stauffer Trip” to Israel in 2020. From Diane; “A most congenial group with some exuberant first-timers. … a superior visit.” Mitzpe Ramon crater, camel & jeep rides, Sde Boker, Elon Moreh, Shilo, Gideon’s Spring, the Temple Institute and EVERYTHING else that makes a trip so special dotted their itinerary. If you’re from the Birmingham area you really need to try to hook-up with Diane Wither’s on one of her trips to the Holy Land. What a special trip we had with the ZCWA Dance Ministry in May. One of our main focuses was to be in Jerusalem for the 50th Anniversary/Celebration of Jerusalem Day. On that day we ministered in dance at an open air mall, flash (mob) dancing at another mall outside the Old City and then ended the day at a Retirement Home with some of the very people who lived in Israel during the liberation of Jerusalem fifty years ago (what an experience, probably the high light of the trip; or at least one of them). We were also there during President Trump’s visit to Israel; made you proud to be an American. And for the first time we took a group to the Burma Road (check your history books). Great trip, wonderful folks – gearing up for 2018. Percy and Sara Jo gathered friends and family from Atlanta, Mississippi and Indiana to join the Group departing Charlotte the first of March. We did most of the usual “first-timer” sites as we journeyed the country; from the desert, to the Galilee and then up to Jerusalem. It was an excellent and successful trip enjoyed by all who ventured with us from the States. One of our great pleasures was the number of young people on this tour; ten of the thirty-seven were under thirty years of age (passing on the love of Israel to the next generation). Yes, you read that correctly; this was a small group of seven (five from Birmingham and two from Australia). Have heard from several who went on this trip and it seems everyone was greatly impacted and blessed. Diane is a great teacher and brings a wealth of knowledge and insight on all the Trips she brings. The summer months can be a bit warm in Israel but it does give you a perspective and understanding of what the Israelites of the Old Testament experienced during their trek through the wilderness. I also makes you grateful for air conditioning. This Group came from Pennsylvania, Kentucky and a good time was had by all. Many thanks to Robert Stauffer for putting together this Group which included ten pastors, one of which was from Sierra Leone. One of the many high lights was worshiping with a Messianic Congregation in Tiberius; how beautiful the Body of Christ. Boy did we bridge the generational gap with this trip, ages ranged from 26-92. Our host pastor Dr. Weaver from Allison Park, PA gathered his congregation and their friends and family and we together enjoyed The Land of the Bible; all of it. Even here in early April we were able to begin our trip in the desert and several days later see much of the top of Mt. Hermon still draped in snow. ZCWA is a worship and dance ministry from Charlotte, we often partner with them to do trips which involve ministry and dance. Israel can sure get hot the end of June, it really gives you a great perspective on what the Children of Israel experienced wandering in the wilderness for forty years. We begin our trip at Abraham’s Well with two friends from Beer Sheva. Later on in the tour we went to Nimrod’s Fortress in the Golan for an interesting “adventure”. Once in Jerusalem at Yad Vashem we visited the Valley of Lost Communities which memorializes over 5,000 Jewish Communities that were completely lost/annihilated during WW II; truly there are not words to describe what you feel. Most of this Group was from the immediate Charlotte area but we had six additional folks from a church in Waxhaw and other s from as far away as Michigan and Idaho. We landed in Israel on Purim and went directly to Abraham’s Well in Beer Sheva where we began our journey with a “salt covenant”. Again, Yad Vashem (the Holocaust Museum) makes indelible memories; the visits to the Death Camps exhibit and the Children’s Memorial left lasting impressions. Safely home we already began to think about our next Trip as part of our heart now resides in Israel. Once again setting foot on this piece of real estate that is so special to the Lord and many of us. Can you believe it; we not only walked where Jesus walked; but we also traveled in the steps of Abraham, David, the patriarchs, apostles, and multitudes of those who have gone before, wow! One of the best memories of this trip was the story of two sisters who joined us from Louisville, KY who have been saving money since childhood to one day go to Israel; to see their dream fulfilled; priceless. From the stark beauty of the desert, to the icy plunge beneath the waters of the Jordan, to the wonder of the Old City teeming with life, to the spectacle of the empty tomb …. the memories are abundant. I know everyone on the trip has favorite places, remembered laughs and stories. Aren’t we glad for journals and pictures. What a joy to dance our way across Israel with this Group, one of our best trips ever. And even here at the end of June the weather could not have been more perfect. The desert is always one of my favorite places and an added treat on this trip was seeing an acacia tree at Ein Gedi filled with hundreds and hundreds of butterflies; a feast for the eyes. Truly something new on every trip. 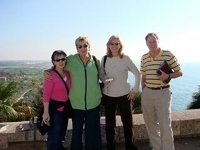 A group from Charlotte, NC boarded a plane and headed to Israel the middle of March for a fun-time of touring and also ministering to The Land. Having received a word from the Lord to go to the “high places” and speak and prophesy to The Land and her people we began our little adventure with joyful hearts and full of faith. It was good to be back and I can assure you the frigid waters of the Jordan made our baptismal experience a memorable one. We are always thrilled to see the many ways the Lord leads as when we get there. Pastor Chuck King from Ft. Smith, AR hosted a group from Arkansas and Oklahoma who spent eight nights this summer touring with worship being a primary focus of this trip. Where we (Jeanne and John) weren’t personally able to join this group except for one day at the Dead Sea; the excellent Israeli guide and bus driver helped make this a trip of a life-time for those who went. Dr. Stauffer put together a group from Pittsburg, Louisville, Charlotte, Nashville and even one from China (an American teaching there); seven of which were under thirty. This demographic is a real target group for us because our heart is to get the future leaders to Israel to give them a first hand opportunity to touch The Land and meet the people that are so precious to Him. This trip covered nine wonderful nights, hot days and late night card games. He was good! He was Faithful!